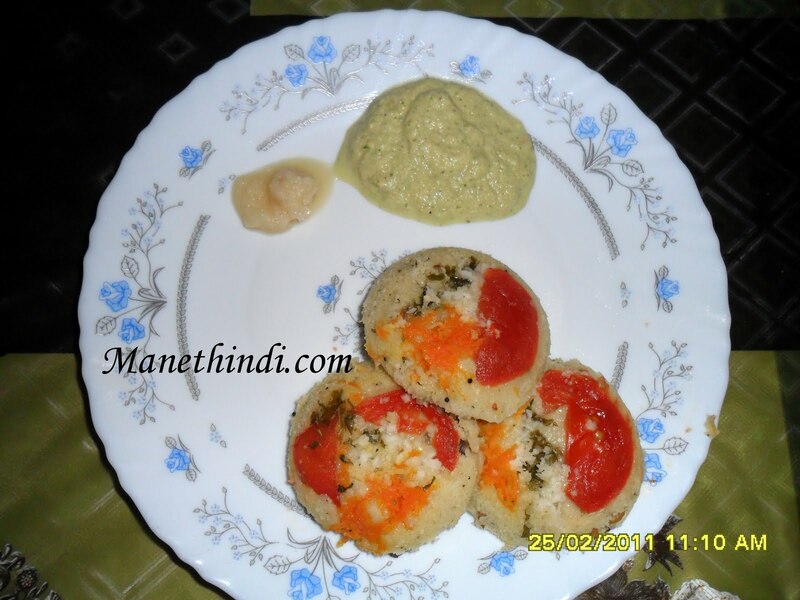 Rava Idly - One of the popular breakfast items in namma Bengaluru. It is made of rava/sooji(semolina) and hence very nutritious and healthy! Thanks to my mum for teaching me this yummy stuff! Take 1tbsp oil in a kadai and fry rava till the colour changes to light red and starts giving nice smell. In the same kadai, take another tbsp of oil and heat it. Once hot, add the seasoning items i.e., Mustard, channadal, urad dal, curry leaves, coriander, ginger and finally cashewnuts. In a big mixing bowl, mix the fried rava and the seasoning. To this add curds, soda, coconut and salt to taste. Mix well. Add additional water to bring it to thick pouring consistency. Make sure its not very watery! Take the idly plates, grease it with some oil and place the shredded carrots, tomato slice, coriander and a v little coconut shreds. Arrange it for all the plates and once done, pour the batter to each slot. After pouring the batter, the plate should have space for the idly to raise. Let it cook in a idly cooker or regular cooker with the vent open for about 10-15 mins in medium flame. Enjoy this lip smacking recipe!